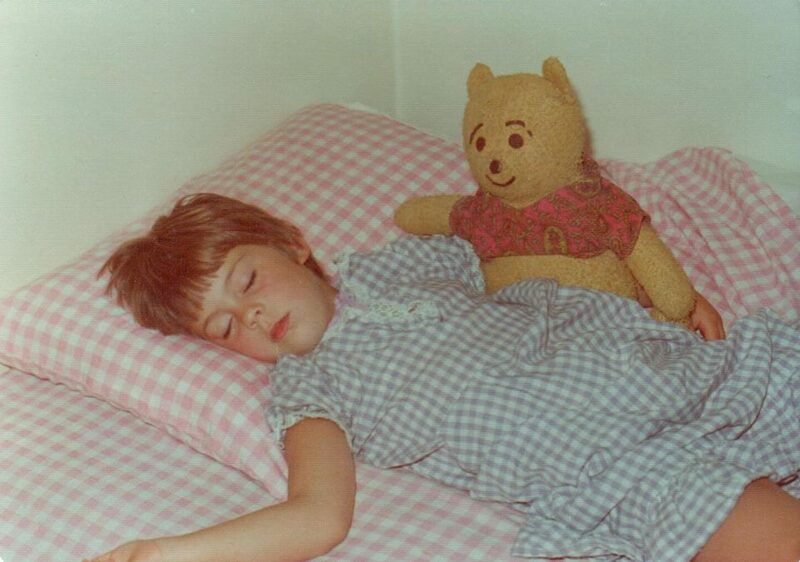 I have blogged several times about my Winnie The Pooh and the fact that we celebrate our birthday together every year. My mother made him from a 1960’s McCall’s pattern and gave him to me on my first birthday. He has seen me through every happy and every sad time in my life. It may sound strange that an almost fifty-year-old woman still has a stuffed teddy bear, but I can’t imagine my life without him. Though Pooh has undoubtedly been scarred by some of the trials he has witnessed me going through, nothing could have been as devastating as his physical altercation with a Woozle, known to humans as a Black Labrador Retriever. I was not there to witness the carnage but I came home from work to the aftermath. The trail of foam that led upstairs to the discovery of Pooh’s ravaged face made me burst into tears. I was twenty-one years old and called my mother in hysterics because Pooh had been assaulted and he lay in pieces in front of me. After some amateur plastic surgery, thanks to my Nana, Pooh had a new face and a new outlook on life. He had survived what was arguably his worst day and had come out on the other side. He now resides on a shelf above my bed. It’s not quite the one-hundred-acre wood he was accustomed to but he seems to have acclimated. Last night, I watched the movie Christopher Robin starring Ewan McGregor. When Pooh asks how old he will be when Christopher Robin is one-hundred and Christopher Robin answers ninety-nine, the tears started. That is me and my Pooh. 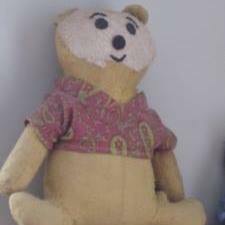 He came into my life on my first birthday and my mother knew my fondness for a silly old bear of very little brain would lead to a lasting relationship. Pooh is my constant. Regardless of what life throws at me, he represents my past, he remains an ongoing part of my present and he will stand beside me going into my future. For being a bear of very little brain, his intelligence speaks volumes. He will forever have the wisdom to just sit back and listen.